Big biz, social maneuvering, at venues swank and rank in the 1950s. • Drive your business by manipulating the lives of your employees. • Schmooze powerful industrialists, by parading your puppets before them. • Seduce rivals, spark incidents, stoke passions; anything to swing deals! • Win through exploitation or sentimental nonsense. 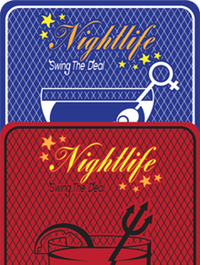 A physical card game, player "decks" are pre-constructed from a card set sold complete. 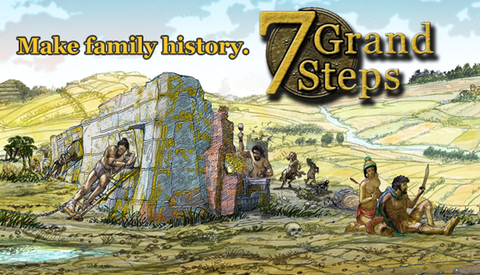 A journey of ancestors through civilization. $20 for Windows. For Macs, see below. In the 1920s, young women had a chance to change society--by misbehaving. Gather a gang of girls. Explore. Battle petty townsfolk with quick, naughty games: Fib, Flirt, Taunt... Win boyfriends and other useful prizes. Expose the town's depraved secret before it entraps your girls. Delightful reading. Comic book as theater. You're the director. Poor Wednesday: a new life, a pure heart, and powers of the cosmos - can anybody save her? An elegant new way to interact with a story. A magical, sassy sit-com. $10 for Windows. For Macs, see below. A Sci-Fi radio play, in the old style. Performed by the Literal Garage Co. players.